In most states and metropolitan areas, substantial policy issues – such as zoning and land use decisions – are largely under the control of those who have a principal interest: local voters who actually live in the nation’s cities, towns, villages, townships and unincorporated county areas. This may be about to change. Two congressional initiatives – the Boxer-Kerry Cap and Trade Bill and the Oberstar Transportation Reauthorization Bill – and the Administration's “Livability Partnership” take direct aim at local democracy as we know it. The Boxer-Kerry Bill: The first threat is the proposed Senate version of the “cap and trade” bill authored by Senator Barbara Boxer-Kerry (D-California) and Senator John Kerry (D-Massachusetts). This bill, the Clean Energy Jobs and American Power Act (S. 1733), would require metropolitan planning organizations (MPOs) to develop greenhouse gas emission reduction plans. In these plans, the legislation would require consideration of issues such as increasing transit service, improvements to intercity rail service and “implementation of zoning and other land use regulations and plans to support infill, transit-oriented development or mixed use development.” This represents a significant step toward federal adoption of much of the “smart growth” or “compact development” agenda. At first glance, it may seem that merely requiring MPOs to consider such zoning and land use regulations seems innocent enough. However, the incentives that are created by this language could well spell the end of local control over zoning and land use decisions in the local area. True enough, the bill includes language to indicate that the bill does not intend to infringe “on the existing authority of local governments to plan or control land use.” Experience suggests, however, that this would provide precious little comfort in the behind-the-scenes negotiations that occur when a metropolitan area runs afoul of Washington bureaucrats. The federal housing, transportation and environmental bureaucracies have also been supportive of compact development policies. As these agencies develop regulations to implement the legislation, they could well be emboldened to make it far more difficult for local voters to retain control over land use decisions. There could be multiple repeats of the heavy-handedness exercised by the EPA when it singled out Atlanta for punishment over air quality issues. In response, the Georgia legislature was, in effect, coerced into enacting planning and oversight legislation more consistent with the planning theology endorsed by EPA’s bureaucrats. No federal legislation granted EPA the authority to seek such legislative changes, yet they were sought and obtained. There is also considerable support for the compact development agenda at the metropolitan area level. The proclivity of metropolitan and urban planners toward compact development is so strong as to require no encouragement by federal law. The emerging clear intent of federal policy to move land use development to the regional level and to densify existing communities could encourage MPOs to propose plans that pressure local governments to conform their zoning to central plans (or overarching “visions”) developed at the regional level. Along the way, smaller local jurisdictions could well be influenced, if not coerced into actions by over-zealous MPO staff claiming that federal law and regulation require more than the reality. It would not be the first time. Further, MPOs and organizations with similar views can be expected to lobby state legislatures to impose compact development policies that strip effective control of zoning and land use decisions from local governments. Surface Transportation Reauthorization: The second threat is the Surface Transportation Authorization Act (STAA or reauthorization) draft that has been released by Chairman James Oberstar (D-Minnesota) of the House Transportation and Infrastructure Committee. This bill is riddled with requirements regarding consideration of land use restrictions by MPOs and states. Unlike the Boxer-Kerry bill, the proposed STAA includes no language denying any intention to interfere with local land use regulation authority. Like the Boxer-Kerry Bill, the Oberstar bill significantly empowers the Department of Transportation and the Environmental Protection Agency and poses similar longer term risks. The Administration’s “Livability Agenda:” These legislative initiatives are reinforced by the Administration’s “Livability Agenda,” which is a partnership between the EPA, the Department of Housing and Urban Development and the Department of Transportation. Among other things, this program is principally composed of compact development strategies, including directing development to certain areas, which would materially reduce the choices available to local government. Elements such as these could be included in an eventual STAA bill by the Obama Administration. The Livability Agenda: Regrettably, the Boxer-Kerry bill, the Oberstar bill and the “Livability Agenda” will make virtually nothing more livable. If they are successful in materially densifying the nation’s urban areas, communities will be faced with greater traffic congestion, higher congestion costs and greater air pollution. Despite the ideology to the contrary, higher densities increase traffic volumes within areas and produce more health hazards through more intense local air pollution. As federal data indicates, slower, more congested traffic congestion produces more pollution than more freely flowing traffic, and the resulting higher traffic volumes make this intensification even greater. There are also devastating impacts on housing affordability that occur when “development is directed.” This tends to increase land prices, which makes houses more expensive. This hurts all future home buyers and renters, particularly low income and minority households, since rent increases tend to follow housing prices. It is particularly injurious to low income households, which are disproportionately minority. The large gap between majority and minority home ownership rates likely widen further. So much for the American Dream for many who have not attained it already. The Marginal Returns of Compact Development Policies: These compact development initiatives continue to be pursued even in the face of research requested by the Congress indicating that such policies have precious little potential. The congressionally mandated Driving and the Built Environment report indicates that driving and greenhouse gas emissions could be higher in 2050 than in 2000 even under the maximum deployment of compact development strategies. Local Governments at the Table? The nation’s local governments should “weigh in” on these issues now, while the legislation is being developed. If they wait, they could find bullied by EPA and MPOs to follow not what the local voters want, but what the planners prefer. Local democracy will be largely dead, a product of a system that concentrates authority – and perceived wisdom – in the hands of the central governments, at the regional and national level. Submitted by wendylowhy on Tue, 10/08/2013 - 00:40. Submitted by soundplanning on Fri, 11/06/2009 - 15:38. In my world these are powers of the state, not the federal government and local governments will not give them up. As an MPO Director with a Board composed of local elected officicals I am not going to fight them for it. MPOs are concerned that the pending legislation presumes more than we can deliver. Submitted by ZZMike on Fri, 11/06/2009 - 13:58. There's another one: the Clean Water Act of 1972 apparently gives Federal control to all the water in the country. Some claim this would extend down to your bathtub. That may be overstating the case, but the term " 'significant nexus' to 'navigable waters' " might be broadly interpreted. Submitted by Jay on Fri, 11/06/2009 - 13:07. I agree with a previous poster: when density is done right, people will start moving to public transportation. The inner suburbs in DC are a good model for this (those along the various Metro lines). And if there is more traffic due to density, it will encourage more people onto public transit, which is a good thing. Many critics of density, like Wendell Cox, decry the higher cost of living that density brings. But it never seems to occur to anyone that denser living is higher cost BECAUSE PEOPLE WANT TO LIVE THERE! Basic economics dictates that high demand = high prices. People like density. People like walkable communities, with convenient public transit. Instead of bashing density, Wendell Cox and other policy-makers should concentrate their efforts on perfecting density for middle- and low-income consumers. The obvious solution is to increase supply of dense communities. To say that because density is expensive, and that therefore we should avoid density, is a defeatist attitude akin to throwing the baby out with the bathwater. Submitted by Woozle on Wed, 12/23/2009 - 22:25. What deluded, self-indulgent fantasy. 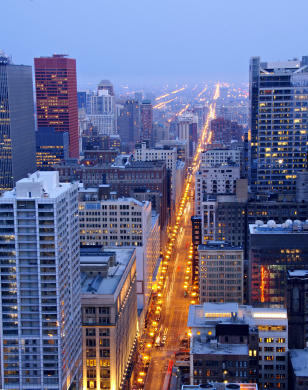 American-born residents are fleeing from Chicago and New York City metropolitan areas at the rate of several hundred thousand each decade from each city to smaller locales with virtually NO public transportation. The country has grown MORE suburban, not less, in the 2000's. Submitted by epar on Fri, 11/06/2009 - 11:33. Few things have done more to impede the provision of affordable housing than local land use control, as anyone familiar with the circumstances surrounding the Mt. Laurel cases in NJ would know. When municipalities can restrict residential development, they have every incentive to zone for large lots and low growth, thus preserving property values and maximizing school spending per student. I am very skeptical that wresting zoning power from towns would have a "devastating impact" on housing affordability. That statement is an extreme generalization that conflates many different types of land use regulations, some of which hurt affordability (i.e. the status quo policies adopted by most municipalities today) and some of which may help it - like policies that allow a mix of housing at higher densities. All else being equal, higher density means more supply and lower prices. As for increased congestion, the very simply truth is that density can be done well or it can be done poorly. When more single-use development clusters are placed closer together, the inevitable result is more traffic congestion. This is because there are more people living closer together who still have to rely exclusively on their cars to get around - see Northern Virginia for an example. The obvious solution is to design communities in a way that makes alternative modes more convenient and economical. There is nothing inherently unaffordable about these types of communities, except that there are few of them because modern zoning precludes them. The reality is that designing denser, multi-modal communities is the only sustainable option we've got. The alternative, which you would have use pursue, is to pave over every inch of land until everyone can travel at least 55 mph uninterrupted to any and every destination. Have you calculated how many square miles of pavement this would require? How much of Manhattan would have to be demolished to accommodate highway lanes for all of its commuters? Submitted by The Placemaking Institute on Sat, 11/14/2009 - 20:02.
epar says: "Few things have done more to impede the provision of affordable housing than local land use control." It doesn’t matter what kind of growth is in fashion, whether the recent “smart” fad or the suburbanly sprawling increasingly dumb growth that has held sway for 60 some odd years by the perpetuation of the American Dream myth, which is nothing but a domestic version of Manifest Destiny (which messed up/set back by decades if not centuries the economic growth of, among others, Latin America). As long as the top 1% holds wealth that amounts to more than the total wealth accumulated by the lower 95%, no truly sustainably affordable housing of any kind will ever be achieved. Trying to do so without acknowledging that fact results in one rearranging the Titanic's deck chairs to keep it from sinking. Submitted by Hoss on Fri, 11/06/2009 - 09:33. Leftist fundamentalism at work: even more dangerous to the growth and stability of this country than religious fundamentalsim (where at least we have some judicial separation). Submitted by The Placemaking Institute on Sat, 11/14/2009 - 19:51. ...being able to make such a remark. Ever since Goldwater, without whom Reagan would only be remembered as a bad actor/great advertising pitchman/governor who tried to legalize marijuana in order to tax it, this country has only shifted further and further rightward such that the presidency of Clinton? Was much more conservative than that of Nixon and yet folks endlessly and ceaselessly decried him as nothing but a pre-verted lib'ral. In regards to this, I think that the remark that Mister Cox's made during the Bush II presidency is appropriate enough to quote here: "A lot of what passes for a public process in this country is what I would call a dictatorship of busybodies. You know, you open up the process to all comers, and I like, I'm not sure that what they're doing in Perth is the way to go, but it sounds like a much better way than this idea of self-selecting the people who are interested in interfering with the lives of others."